I still run 2 copies of this in my Tinker's Sharpsword Oil Kingsbane rogue. Works really well to draw my Cavern Shinyfinders or the mighty Kingsbane itself! It seems like the guy isn't running in the golden animation. He doesn`t run. He moves the universe around him. 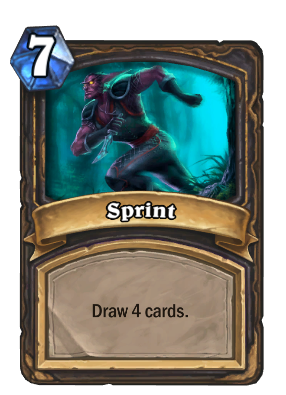 4 mana and 2 cards to draw 4 cards. Seems pretty solid. Well, considering the end result is just 2 cards drawn, isn't paying 4 mana a bit too much? Compare it with Arcane Intellect. A better comparison is Nourish, and I think you'll see that Prep/Sprint comes out on top. If you have cards that help lower cost of cards then this card or if you are in the late gane then it is good. but what? and was that a pun? Sprint x 2 are a reward for raising a rogue to level 10. Golden Sprint is a reward for raising a rogue to levels 49 and 50.